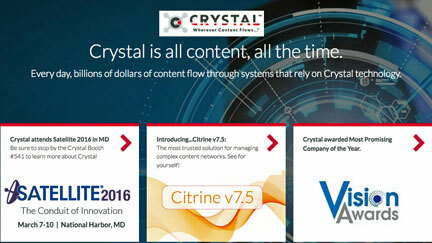 [Satnews] Building on its long history of revolutionizing the task of monitoring and managing systems in complex mission-critical environments, Crystal announces their latest version of Crystal Control, Citrine v7.5. Crystal Control, a Network Management System (NMS) centralizes, tracks, and visualizes signal flow through entire video and data networks that use satellite and fiber transmission paths. Citrine v7.5 features a number of exciting upgrades for improved efficiency and greater operator control. Included in Citrine v7.5 is Logic, an innovative automation and logic processing component. Logic automates fault handling, which ensures faster resolution and reaction to any given fault condition. Logic builds on the concepts of Crystal’s existing automation engine and adds user-facing configuration through an editing interface. This new release of Crystal Control includes upgrades to the real-time Active Faults report streamlining record storage, fault acknowledgement process, and navigation to fault history. In addition, user interfaces are synchronized faster upon start up and fault acknowledgement. Citrine 7.5 empowers users with UI Search, a new “free search” capability that quickly finds desired devices wherever they are in your system. UI Search searches device name, device DSD, device attribute names, device attribute values, device attribute list items, screen titles, screen labels, and screen widget IDs for text and provides direct access to control screens that are normally available only through a hierarchy of system level screens. UI Recorder is a vital new tool built into Citrine v7.5 that captures user actions for audit purposes and allows users to browse, search for, and download UI interactions through a user-intuitive web-based logging dashboard. Citrine v7.5 features a simplified process for editing and customizing screens and improved storage and analysis of logs and trending data, as well as delivering overall system health monitoring. Based on 64-bit CentOS 6, the enhanced platform allows the system to take advantage of more RAM and provide a progressive reporting tool ecosystem. Remote system control is easier through a Linux ZFC client enabling remote control of Crystal GUIs from other Linux systems when Windows machines are not present and includes a new streamlined process for authenticating ZFC users.